Clear messaging about our 2012-2013 goals to assist your leadership planning. Breakout toolkit session to help new leaders manage their projects efficiently. Hands on breakout training with our Digital Cheetah Representative, Colleen Geisler. Lunch meetings by Wing to discuss strategic initiatives for the year. Carol Scott, AJLI Consultant & Fundraiser extraordinaire, speaking on a variety of topics. & Michelle Haines – michellejhaines@gmail.com. The 2011-12 Board of Directors has watched over an extraordinary year in the Junior League of Seattle. From voting in a new organizational structure to seeing our newest community projects, Kids in the Kitchen and Lifeskills for Women flourish, to overhauling and improving our communication and social media efforts, to serving hundreds and in some cases, thousands of children with our projects and services, we have accomplished a great deal. We have much to be proud of, not the least of which is the simple fact that voluntarism lives in our hearts and continues to be the foundation of our amazing organization. Thank you to the 2011-12 Board of Directors. I have trouble finding words that adequately express my admiration for your thoughtfulness, passion and stewardship. To all the women who accepted leadership roles, whether chairing a committee, working as an advisor, I am so grateful. To every Active, Sustainer and New Member who stopped me at an event, picked up the phone or sent an email with a new idea or words of advice, I thank you. My one regret this year is that I have not had the opportunity to get to know each and everyone of you as well as I would have liked, the year did go by amazingly fast. Yet on a very real level I do know you. You are the women who lead and who gladly follow other leaders. Voluntarism is vital to your lives. You can be found fitting your personal life around your Junior League life. You rejoice in the daily victories of the women and children who you serve. You send emails in the wee hours of the morning. You work like mad. You challenge yourself to ask for the dollars that keep our community projects running. You are positive forces in this community. You are problem solvers. You are hand-holders. You have families and friends that are very proud of you. You are the women of the Junior League of Seattle and I have been so honored to lead you. Ashley Baerwaldt takes the gavel and I am delighted to pass this on to an incredibly gifted and talented woman, someone I can also call a very dear friend. Ashley is an outstanding leader and the League is in very good hands. Please join us on May 15th to celebrate the Junior League year as we highlight our accomplishments, recognize our Provisional, Active and Sustainer of the year as well as those members celebrating five and ten years of Active status in the League. We are also thrilled to honor and recognize our Dorothy Stimson Bullitt award recipient, Kathy Randall. Social begins at 6:30pm and our meeting will start promptly at 7:00pm. Attention Provisionals and Sustainers! You are also invited to attend a champagne toast, hosted by our Sustainers from 5:30-6:30pm. Lastly, this is your chance to get a photo taken or updated for next year’s Greenbook. The photographer will be available at 5:30pm to take pictures of Sustainers and Provisionals and Actives should arrive at 6pm to have their picture taken before the May Celebration meeting begins. Please note: no jeans allowed at the Seattle Golf Club. RSVP by May 8th for the Sustainer/Provisional champagne toast. RSVP on our website for May Celebration. Starts promptly at 6:30pm, so please arrive early. Placement Fair starts at 7:30 pm. Social time will be held concurrently with the Placement Fair. As always, voting is mandatory, so if you are unable to attend the meeting, please reach out to the JLS office at askus@jrleagueseattle.org to get your link to vote online. Online voting will close at noon on Tuesday, April 17th. Please ensure to vote before then, or attend and vote in person, to avoid the $50 fine. The voters guide can be found at http://www.jrleagueseattle.org/?nd=apr_vg_2012. Please spend a few minutes to review the motions ahead of the meeting so you are informed about the issues we are voting on. Items on the ballot will include our budget for 2012-2013. Passing motions and the budget for 2012 – 2013 are not the only issues on the agenda that affects the League’s agenda. After the voting meeting, the Membership Wing will be hosting the annual Placement Fair, during which time all incoming and outgoing Chairs and Vice-Chairs of the League’s committees will be available at various booths to answer questions about their committees and help you make decisions about the future of your League career. The Placement process will begin after the Placement Fair on April 17, 2012. In the meantime, you may view the catalog of available committees on the website at http://www.jrleagueseattle.org/?nd=placement_descriptions_12_13. Once Placement begins you will be asked to select five committee choices and submit via the online Placement Tool. April 17 Placement Fair – Website enabled after the Active Placement Fair. May 4 – Deadline to fill out web application. Mid May – All members who have paid their 2012-2013 dues will be notified of their 2012-2013 placement. This entirely volunteer organization was launched with the purpose of furnishing the Mansion’s public rooms without using any tax monies. In 1973 the Legislature appropriated funds for a substantial renovation of the Mansion and the addition of five private rooms. In 1989, Washington State’s 100th birthday, a group of citizens created a special Centennial gift. Over $300,000 was raised providing a permanent fund for the preservation and enhancement of the Mansion’s historic public rooms. In 1988 the name of the organization was changed to the “Governor’s Mansion Foundation.” Today the Washington State Governor’s Mansion is recognized as one of the finest homes of its kind in the country and the Foundation remains a non-political, volunteer organization dedicated to the support and maintenance of its public rooms, including acquiring Northwest art, books, and period furniture. From Mrs. Gandy who served as Chair of the founding organization to Founding Trustees Mrs. Bryant Dunn, Miss Patricia Baillargeon, Mrs. Donald Foster, Mrs. Elmer Nordstrom, and Mrs. Sheffield Phelps, the Junior League of Seattle has played a major role in saving and restoring the Mansion. Virginia Kitchell, Diana Neely, and Jane Langlie have served as presidents of the Foundation and other Seattle League members serve as Trustees of the Foundation to this day. On May 30, 2012, The Governor’s Mansion Foundation will celebrate its 40th Anniversary at the Governor’s Mansion in Olympia from 5:30 to 7 pm. Those wishing to attend the celebration, representing the Junior League of Seattle’s role in establishing the Foundation, should contact Gale Barre, gmbarre@comcast.net. For security reasons, attendance is by invitation only. 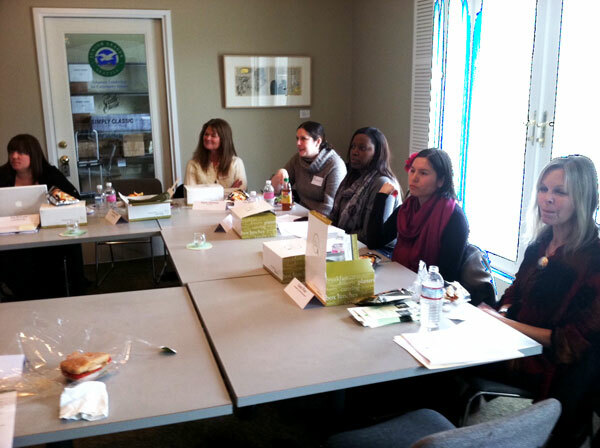 On January 25th, the Project Development committee hosted a Collaboration Luncheon for three of the League’s newest community partners: YWCA Young Parent Program, New Beginnings, and Mary’s Place. Junior League Director Jeanette James led a lively discussion among key League members and partner representatives about their collaborative efforts to provide adult women with a variety of practical skills and education. Focusing on the League’s newly formed Life Skills for Women committee (LFW), the League specifically sought to evaluate its relationships with these partners by looking at current project collaborations and exploring potential areas of expansion and opportunities for advocacy. Develop a set of best practices for working with new community partners. Continue to address the high demand by partner clientele for job skills training and financial literacy. Partners enthusiastically responded to a proposed League-branded curriculum that could be implemented with multiple organizations, thus reaching more women. Consider expanding LSW committee offerings via mentorships. Share relevant areas of opportunity with the Done in a Day, ENERGY, and Kids in the Kitchen committees. Continue exploring advocacy opportunities by further understanding the community partner’s needs and issues facing its clientele. (3) and an increase to Membership Dues. The revised organizational structure and sunsetting of our beloved LifeBooks committee motions passed. The motion regarding membership dues did not pass as currently written. Membership dues for the 2012-2013 League year will remain the same at $175 for Active Members, $100 for Sustaining Members, $65 for Sustaining Members over the age of 62 and $0 for Emeritus Members over the age of 79. Active Members, your input through the voting process is a vital part of how Junior League of Seattle Leadership plan for the long-term success of the League. Your feedback is equally important. We would like to hear more from you and will be sending out a short survey to you in the near term. Please stay tuned. Notice for All Members: Due to the snow storm that delayed the January General Meeting, the Management Council has voted to suspend the rule that Dues Notices shall be sent out the second week of February. Thank you for your understanding. Notices will be mailed shortly. This General Meeting is a mandatory voting meeting for all Active members. If you are unable to attend the meeting please contact Courtney at the JLS office, askus@jrleagueseattle.org , to receive an electronic ballot. Electronic ballots are due by noon on Friday, February 3rd. Parking: Valet parking is available on Union St. during dinner hours for $10.90 (this includes tax) – there are also various parking garages in the area. Leadership is putting forward several motions at our mandatory January Voting meeting at the Triple Door, January 17, 2012. If you are unable to attend this meeting, you will need to obtain an absentee ballot and submit it to the Junior League of Seattle office before January 17th. The Voter’s Guide has been posted on the website under Communications > Meeting Materials > January Voting Guide. To review talking points for the dues increase and proposed changes to our management council organizational chart brought forward during our November Unit Meetings, please review items posted at Communications > Meeting Materials > 11/11 Unit Meeting Materials. Social in Musicquarium (lounge inside of the Triple Door) from 6:00-7:00 pm. Light appetizers will be served at the social and cash bar will be available. Parking available in the Triple Door Garage on the corner of Union Street and 2nd Avenue for $9.00 per car (must enter garage after 5:00 pm for this rate). Parking is also available in adjacent garages (Benaroya Hall at corner of Union and 2nd and Russell Investments Garage on Union between First and 2nd Aves) and also on the street. Carpooling is encouraged. Details: All members are welcome to stop by for an informal conversation with our Leadership to discuss the motions proposed for the January Voting Meeting. These motions include the proposed membership dues increase, the proposal to restructure our organizational structure, and the proposal to sun-set the LifeBooks committee. If you have questions or comments about these motions that you were not able to voice at the Unit meetings or otherwise, please use this opportunity to come and discuss those with JLS Leadership. This is your chance to be heard before the vote!